General Characteristics: Medium in height, well spreading, maturing within 9 to 12 months, producing from 5 to 10 oha; characterized by dark green petioles, whitish at base with reddish-brown flecks immediately above, and conspicuous broad whitish edges. Petiole: 60 to 80 cm. long, drooping, dark green flecked with reddish-brown, the flecking most pronounced near base, with a conspicuous, broad whitish edge, often tinged with reddish-purplea djacent to the edge, white at base. Leaf blade: 35 to 45 cm. long, 25 to 30 cm. wide, 30 to 40 cm. from tip to base of sinus, narrowly sagittate, dark green; piko yellowish; lobes acute with wide sinus. Corm: Flesh white with yellowish fibers; skin cream-colored, usually with dark purple along leaf-scar rings. 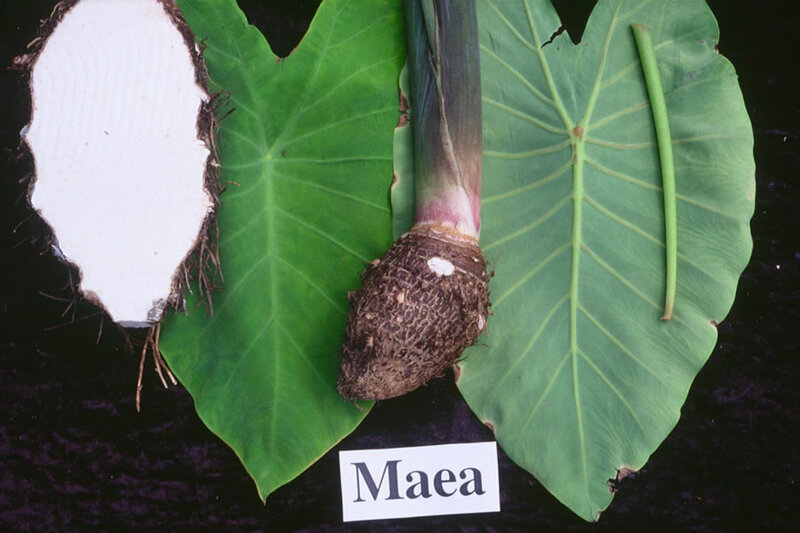 Origin, and derivation of name: Native variety; maea means "strong smelling" or "pungent" in Hawaiian, and probably refers to the odor of the cooked corms. 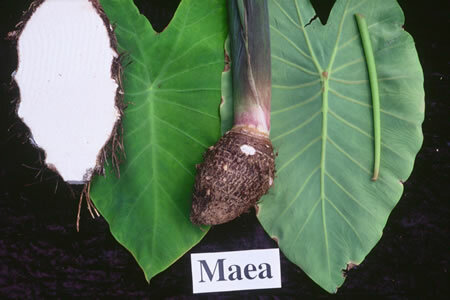 Distribution: Little-known variety, found occasionally under upland culture in Puna, Hawaii.